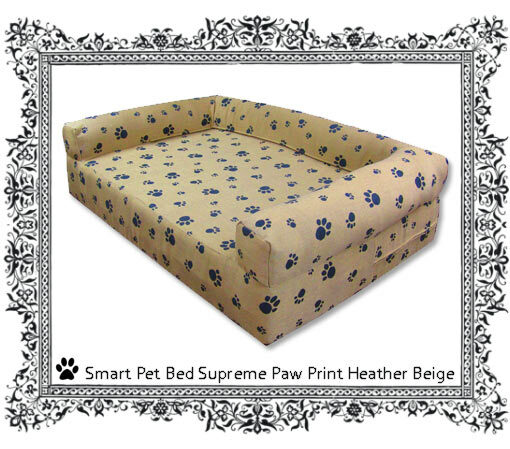 Smart Pet Beds has a few great paw print pet beds in stock (and on sale!) ready to go for an ultimate experience in comfort and durability for your pet. If you're dog is medium sized and weighs anywhere from 35-75 pounds this orthopedic memory foam bed measuring 35" x 27" x 6 + 4" Bolster with a paw printed outdoor fabric cover is perfect for your pet! Your best animal friend will love the way the memory foam conforms to his/her specific body shape and provide a warm and comfortable bed to sleep on. The bolsters on our supreme line of memory foam dog beds provide even more comfort for your pet, especially if your dog needs that extra bit of security and protection. The memory foam will eliminate painful pressure points and help dogs with bone issues such as hip dysplasia, arthritis, and poor circulation. Your dog will be so happy to find peace in his sleep as the orthopedic foam contours to every curve of your pet's body. The paw print dog bed cover can easily be washed and dried -- YES the cover is washable! In addition, these high performance fabrics are stain resistant, mildew/mold resistant, bleach tolerant, hypo- allergenic, and are rated for 5 YEARS against UV fading indoors or outdoors! 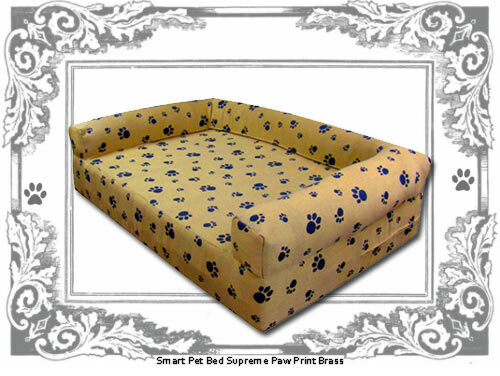 If you are looking for a bolster-less memory foam dog bed with the paw print you are in luck! Our executive series for your pet is perfect. 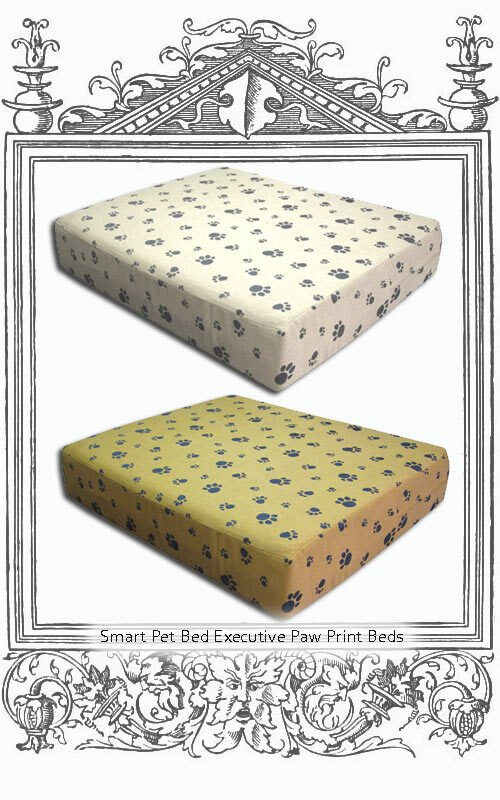 The two executive orthopedic beds below (top: paw print antique beige; bottom: paw print brass) both come with a waterproof protective liner underneath the dog cover to protect the memory foam insert inside from water and moisture. Also, it keeps your dog's bed durable for years to come. Why buy dog beds every year or so when you can have one really excellent dog bed... a Smart Pet Bed !